August is one of my least favorite months every year. The heat gets very tiresome by now; the humidity takes all the wind out of my sails. We had that fabulous cool June, and then Peter and I were fortunate to be in Maine during the worst heat waves in July, although even Maine was hotter than I would have liked some of the time. Now August is being difficult, and I just want summer to be over and crispness to return to the air. I want the freedom to move around outside and live my life without being dominated by the oppressive weather. Today I decided to escape to the library in Copley Square. We have only two air conditioned rooms at home, and I get tired of being cooped up in there; I realized I could take advantage of the library’s air conditioning and spend the day there instead. Shortly after a small breakfast, I took the air conditioned bus to Copley Square and went right into the library, where it was cool and quiet still in the morning. First stop was the café, for second breakfast, a cup of iced tea and a cheese Danish (Friday treat). While sipping the tea very slowly, I read my current library book, Diana Athill’s Alive, Alive Oh!, reflections of a 97-year-old English writer on what seems important as she looks back on her life–my kind of book. I looked through the Globe on my phone, wrote an email to a former colleague who is still working while I’m blissfully retired, and looked at photos on the 365 Project, which I’ve recently started, all while luxuriating in having the whole day ahead of me to spend in the library in whatever way I wished–a play day! It’s not often that I’m able to walk around the city in July, hating the heat as I do, but this year as late as July 2nd I was able to go downtown on a beautiful Saturday and enjoy walking around all afternoon on the Harborwalk. The Harborwalk is a most amazing development in Boston in the last twenty years, which will link 39 miles of public pathways along the waterfront when it’s done, a Sapphire Necklace to go along with the Emerald Necklace of green parks we already have, thanks to Frederick Law Olmsted. Already twenty-some miles are ready, and one can walk all along the waterfront downtown, up and down wharves, and across the channel to the Fan Pier, which affords some of the best views of Boston. I started out at South Station and crossed over the channel. Here I’m looking back over at the old and new buildings. The Tea Party ship is in the foreground. This reminds me of how, when I’m in England and people ask where I’m from, when I say Boston, they immediately mention the Tea Party. Most people around here don’t think about it all that much. I must say I like the Intercontinental Hotel building. I walked along Fan Pier, where the view of Rowe’s Wharf is fabulous, although I don’t like the look of that big cruise boat, the Odyssey, that ties up there. Since my Cape Ann excursion I had been longing to get back to the water, and going downtown to the Harborwalk was a fun and refreshing way to be by the water right in the city. The fine weather held up through July 4th, which was great for all the visitors and the holiday festivities. The next day, July 5th, the humidity set in, and our fantastic stretch of summer weather was over. We were very lucky to have it as long as we did. We were leaving for Maine on July 9th, so we didn’t have too many hot days to get through. We’ve just had one of the loveliest Junes in memory, with day after day of sun, blue skies, and most importantly, low humidity. There were very few uncomfortably hot days in the entire month. While the news in the world has seemed devastating, nature has been at her most benign. I decided not to work as hard this month on the house clearing project and to give myself some time off for excursions within the city and beyond. The neighborhood has been blooming. Right outside our window the rose bush was lush earlier in June. That rose was planted not so many years ago, and it has thrived in the sunny, south facing patch of ground outside our building. As I walk around the neighborhood, I like to look into people’s gardens. The pink and lavender and blue flowers have been heavenly. Meanwhile the ducklings and goslings are growing up at the Pond. We’re so lucky to live in the city and yet have the chance to observe wild life two blocks away at Jamaica Pond. Thank you, Frederick Law Olsted–I will never cease to be grateful. The green and blue tranquility of the Pond is a priceless asset to the neighborhood. I call this the Green Cove, for obvious reasons. The mother duck takes care of her babies all by herself; the male duck is out of the picture early on. The ducklings stick together and stay close to mother. They fall into line behind her in the water, and they’re a lovely, quiet family. I like the duck personality. Meanwhile, in the Canada goose families the father goose is always present, keeping watch. The goslings grow fast. I took the photo of the pretty one on the left on June 6th. By the 19th they had become gawky like the one on the right. We have two sets of goslings at the Pond this year, one group of seven and one of five. The two families join forces to raise the young, so I always see them together, four adults and twelve goslings, with the five being slightly older than the seven. The entrance to my beloved Boston Public Library in Copley Square, the center of my life in the city. I looked up as I entered on a recent afternoon, to see the grillwork reflected on the glass doors, with the lantern shining through in the vestibule. “Free to All” is chiseled in the stone above the doors. In this library I take free classes, attend programs, get books, and always feel welcome. The cloistered courtyard in the center is one of the great public spaces in the city. Last summer I listened to lovely midday concerts there while sipping iced tea and watching birds fly about the courtyard and the sky above. My retirement party (one of them, that is) was an afternoon tea in the library’s restaurant. We citizens of Boston are fortunate to have one of the great libraries in the country as our very own, and I never cease to be grateful. At the end of a recent walk around Jamaica Pond I noticed the lantern over the gateway to the dock shining in the gathering twilight. The mile-and-a-half path around the Pond is our almost daily walk, except when I am downtown walking around there. The Pond is a priceless asset in our neighborhood, two blocks from our home. I am forever grateful to Frederick Law Olmsted for his vision in making the Pond part of the Boston park system and the Emerald Necklace. It’s so important to so many people, and to us who live in the Pondside neighborhood, it is the center of our local geographic identity. Here I’ve watched the seasons for thirty years, taken thousands of photos, observed and come to love the ducks, geese, and squirrels, and watched sunsets and moonrises. When I moved to this neighborhood of Boston from Rockport thirty years ago, the Pond seemed a small substitute for the ocean, but it has grown large in my life over the years. Christmas is my favorite time of year, and I really love Christmas in Boston. 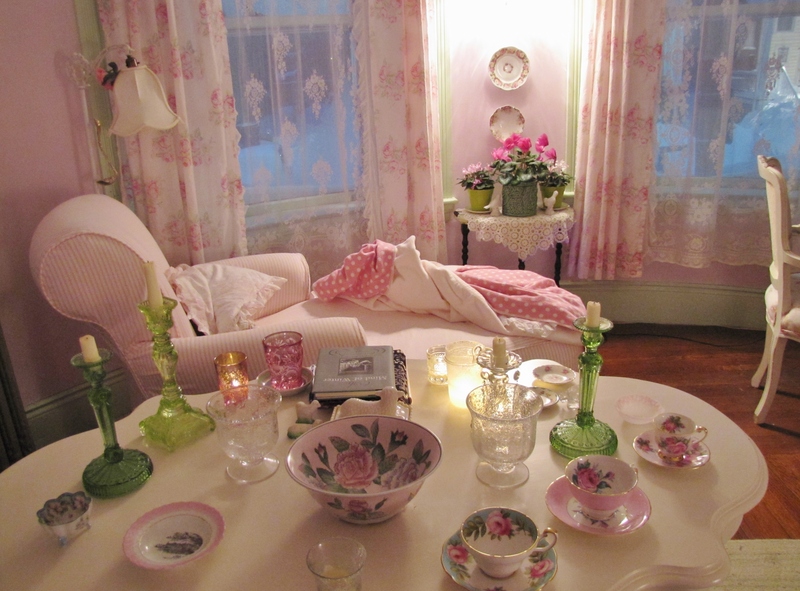 This was my thirtieth Christmas in my Boston home; it gives me chills to think of all those years passing. When you stop to think about it, it is extraordinary that we bring a seven or eight foot tree into our living room. There is no other holiday or time of year when the house is transformed like this. Some say that Christmas is for children, but at the age of sixty-five, I still find it all utterly magical–the lights, the candles, the delicate glass ornaments, the angels, the deeply familiar and stirring music, the warmth and color in this dark time of year. In the weeks of Advent I like to partake in the bustle around town, concerts and house tours and walks to see the lights and decorations and shop windows. I’m aglow with anticipation and excitement. Cupcake Cafe on School St.
On the last Saturday before Christmas I went to the Candlelight Carol service at Trinity Church, as I do every year. The service is almost unearthly in its beauty, almost like a glimpse of heaven. When I came out into Copley Square in the early darkness, an amazing light show was being projected on the façade of my beloved Boston Public Library on the opposite side of the square. I love the way the architectural elements were picked out by the lights and the way the great words across the top of the building are highlighted: The Public Library of the City of Boston Built by the People and Dedicated to the Advancement of Learning. I watched the show several times through. It was a most amazing evening in Copley Square; between the carol service and the light show, I was blown away. 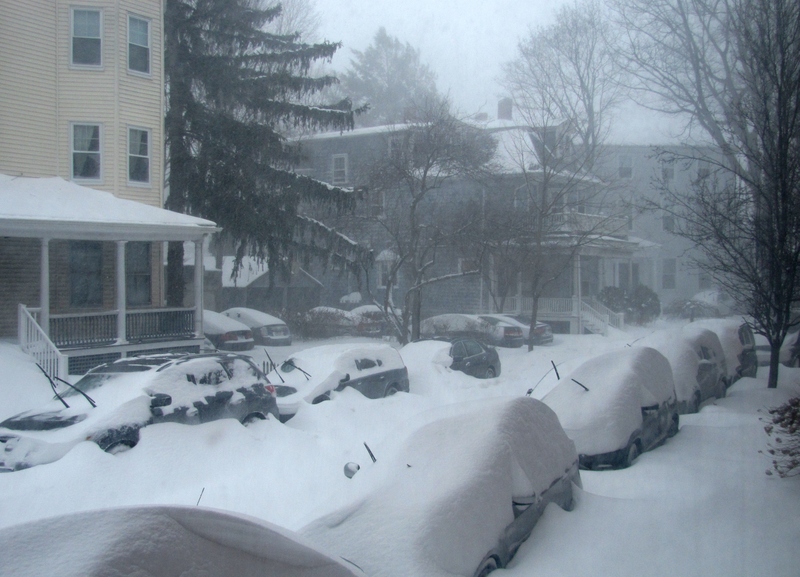 Unlike most people I suppose, I am deliriously happy about all the snow storms we are having in Boston this winter. Until late January the weather had been dull, with almost no snow. In December, including Christmas time, it was too warm. All that changed fast with our great blizzard on January 26-27. This is the first winter of my retirement, and I am extremely glad not to have to get to work in the snow, which would be agony on the bus. I can stay home when the weather is not suitable for going out–what a sensible concept. We live car-free in Boston, and since most of the trouble in snowstorms comes from cars, we are free to enjoy the beauty of the snow. 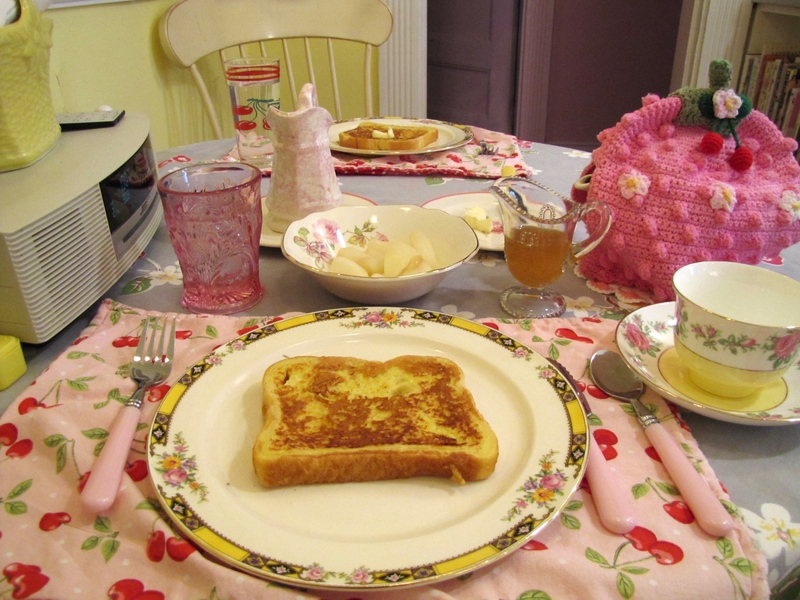 On the morning of the blizzard, we made a special treat breakfast of French toast. I had mine with cooked Bartlett pears and vanilla syrup and a nice pot of Yorkshire Gold tea. I spent most of the afternoon wrapped up in blankets on my chaise longue, where I can look out the tall windows and watch the snow. 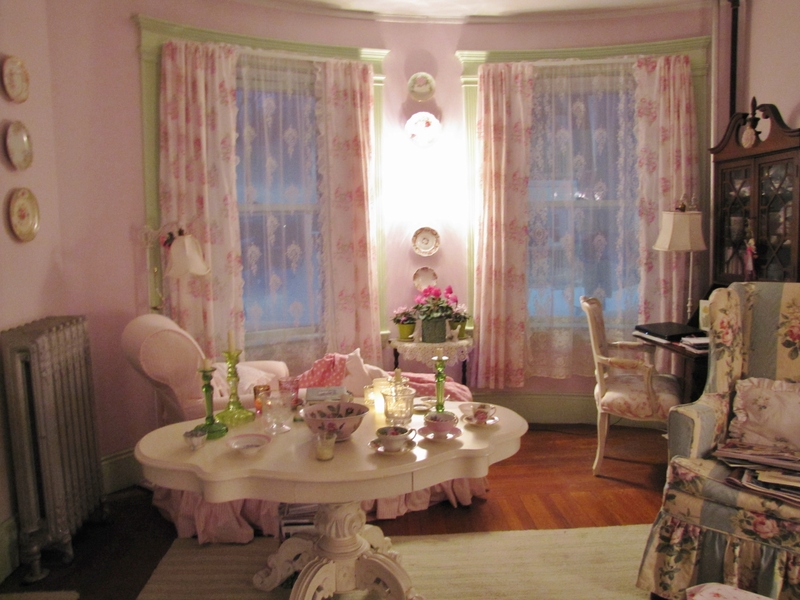 As darkness approached, I lit votive candles, as I do all winter at tea time. A blissful day!